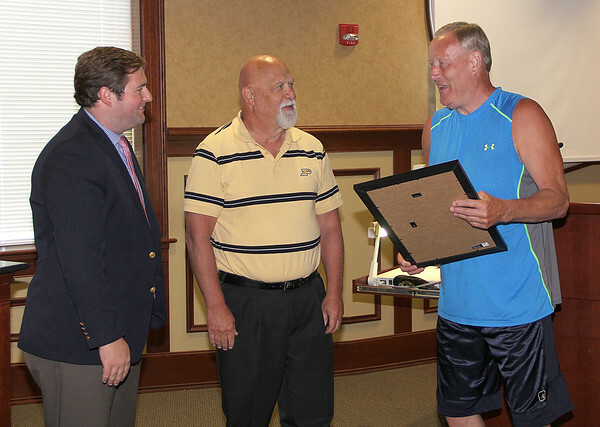 FOREVER RECOGNIZED: Former Lebanon High School basketball legend, and Purdue University star, Rick Mount was honored at Monday night's Board of Works meeting. District 41 State Representative Tim Brown (middle) presents Mount (left) with a plaque of a formal statehouse resolution that names part of I-65 near Lebanon after him. "INDOT will be naming (south) mile marker138 to (north) mile marker 141 in your honor," said Mayor Matt Gentry (left). Mount, a 1966 Lebanon graduate, spoke to those in attendance about people asking him about Steve Alford and Larry Bird having streets named after them and his reply was "maybe when I get older." "It's been 50 years of mayors in Lebanon and finally a Purdue guy, Matt Gentry was named mayor of Lebanon and he came through for me," said Mount while his son and grandchildern watched from their seats. "I appreciate it, thank you, love Lebanon." Mount was the first high school athlete to be on the cover of Sports Illustrated.